As a result of traumatic injury, lack of exercise, over exertion, faulty diet, or the constant assault of the stress and irritation of daily living, we are prone to develop one or more highly irritable spots within muscles referred to as Trigger Points. Trigger Points are the most neglected causes of all muscle pain, yet they are extremely common and will become a distressing part of nearly everyone’s life at one time or another. These points are often recognised during examination. They are usually tender to touch and will radiate pain or sensations to distant, seemingly unrelated area’s of the body. Normal muscles are not tender to firm pressure, and will not refer pain in response to firm pressure. If untreated, trigger points and their resultant muscle spasms will spread and often lead to a complex variety of painful symptoms and complications. The search for trigger points requires thorough and careful examination by a trained therapist. Trigger Points are not the same as pressure points used in acupressure or acupuncture. While pressure points are the same in everyone, trigger points are unique to each individual. Massage therapy allows a reversal of the stress-tension-pain cycle. Pressure specifically interrupts afferent impulses to the spinal cord, reduces the intensity of nervous activity within the tissue and mechanically forces out toxic irritants which have accumulated at nerve receptor sites. 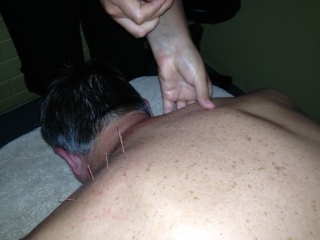 The muscle then relaxes, circulation is increased, and the body returns to normal neuromuscular integrity and balance. Flexibility and strength may then be effectively obtained and maintained. As the most neglected cause of athletic injury and muscle pain, trigger points can literally trigger pain and spasm. The prolonged muscle tension, chronic strain, and traumas which often accompany intense athletic activity can set the stage for development of one or more trigger points and associated painful muscle spasms. If untreated the episodes of pain caused by trigger points will increase in frequency, duration and intensity, often to the point where the athlete feels almost totally disabled. As a result of the affected muscle being in a constant state of hypotonia (spasm) there may be a considerable degree of secondary joint misalignment further increasing the chance of future pain and injuries. It is important to bear in mind that trigger points can and often do occur in well conditioned athletes, thereby leaving them particularly prone to unnecessary injury and disability. Sports massage increases blood flow to a particular area. This speeds up the removal and utilisation of metabolic waste products and increases the supply of oxygen and nutrients to the soft tissue, accelerating recuperation. Coordination and power depend on the ability of a muscle to relax as well as contract. Research has led to the conclusion that most sports injuries simply should never occur. With this in mind, massage therapy offers another step in the treatment and prevention of sports related injuries. Phil and Faye have treated me through years of rehab and pain management after injury. They have massively contributed to a full recovery.